On Friday, February 10th there will be a luscious full moon in our skies. The February Full Snow Moon is also known as the Chaste Moon, an old-fashioned word for pure. This association with purity reflects the custom of greeting the new year with a clear soul. Yet purity is not something our culture usually associates with intimacy, sensuality and feminine attraction energy. I invite you to pause for a moment and think about the word ‘purity.’ True energetic purity isn’t about lack, restraint, or restriction. Purity can be found in the divine experience of the present moment, the hushed stillness of freshly fallen snow covering the earth, and the free-flowing open channel of divine energy coursing like clear water through our mind, body, and spirit. Purity is defined as “freedom from adulteration or contamination.” In what ways has your divine feminine energy been contaminated? We women are pulled in so many different directions. We’re taught to work hard, be successful in our careers, have a family, workout, eat healthy, and look good while we do it all, and do it all perfectly. We’re taught to tighten our grip and try harder. We’re taught to control, control, control. When we operate in these ways, there is no room for imperfection, no room for vulnerability, and no room for sensuality. But we can unlearn these toxic ways of moving through the world. We can learn to harness our feminine alluring energy and tap back into the power that exists in this space inside us. Divine feminine energy in its unadulterated form is a pure, receptive, and sensual yin energy that is free from the contamination of the masculine, goal-oriented yang energy. 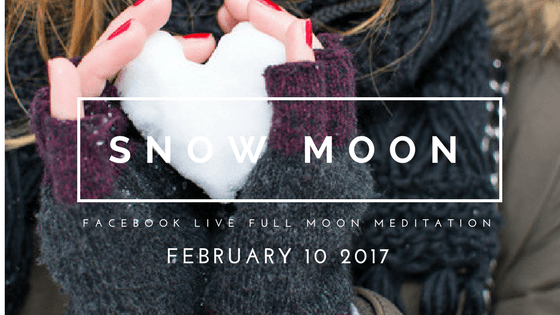 Which is why on the evening of Friday, February 10th I will be hosting a Full Moon Facebook Live Meditation event. Join us! Let’s come together and open ourselves to our divine feminine power.